Thus the conceptual and operational framework of Ayurveda is very extensive and it includes all the essentials to make a man healthy and happy. It comprises the study of right conduct (dharma), which is necessary for the healthy growth of society where the man lives. Additionally it deals with the philosophical aspect of life, the knowledge that contributes greatly to the wellbeing and contentment of all human beings. Dr. G. D. Pol Foundation is the leader in offering innovative healthcare and Management education. The reputation, the highly experienced faculty, the huge campus and the amicable atmosphere of the college makes Dr. G. D. Pol Foundation an exceptional institute. Many more such salient features set us apart from all other institutes offering healthcare and Management education. Thereby, these differences are further responsible for setting our students apart from students of all other colleges. The trust is successfully conducting and managing the Y.M.T. 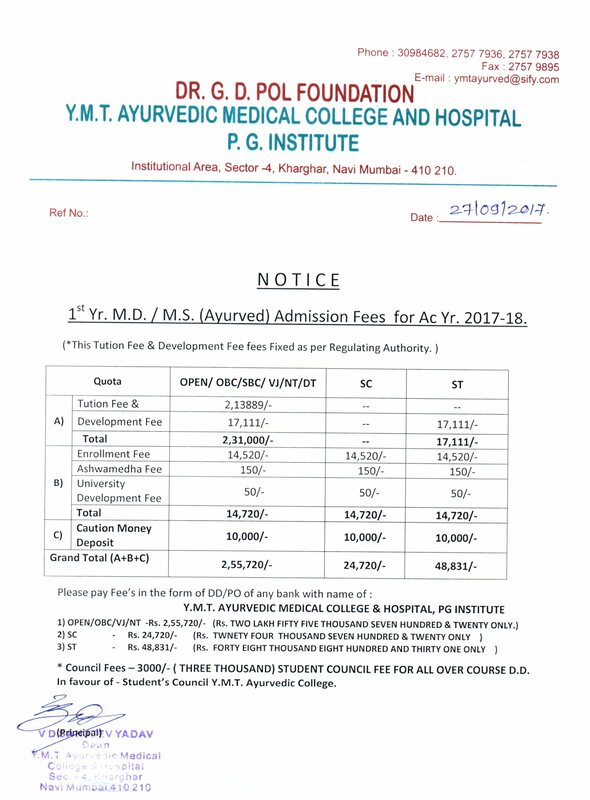 Ayurvedic Medical College, conducting B.A.M.S. Degree course, since November 1991. The Y.M.T. Ayurvedic Medical College is affiliated to the Maharashtra University of Health Sciences, Nashik and recognized by Central Council of Indian Medicine, Ministry of Health, Government of India, New Delhi, an apex body in the field of Indian system of Medicine. The College has an intake capacity of 80 students per annum. This is a fully fledged college which provides all facilities to its students. By the year 2010 there were nearly about 900 Doctors who have passed out from this college and rendering the Health Services throughout the Maharashtra State. Many Students of this college have ranked in the merit list of the B.A.M.S. examinations held by the University of Bombay and Maharashtra University of Health Sciences, Nashik. The Ayurveda college is has well functioning B.A.M.S. and UG courses. We conduct quality PG courses, affiliated by M.U.H.S., Nashik. We continuously train generations of students and mould them into outstanding Ayurveda practitioners and excellent teachers in the field of Ayurveda. We organize workshops, guest lectures, seminars, clinical meetings designed to educate Ayurveda students, Ayurveda practitioners & general public regarding the effectiveness of Ayurveda. We have highly qualified & experienced faculty. Our college has 7.5 Acres of land where in more than 4000 Ayurvedic plants of more than 300 species are planted. A scientific Nakshatra Udyan is developed by the department of Dravyaguna in this area. There is a Central Research lab with all modern equipments developed for UG & PG students to carry out their research works for drug standardization. Rasa Shastra & Bhaishajya Kalpana department prepare Ayurveda Medicines in the pharmacy of our institute. We have a Govt. approved T.B.OPD for poor and needy patients.